Slippery, Slimy Slugs and Snails! These are just a few of the inquiries we’ve gotten this season about plants (especially hosta) that have holes chewed in the leaves and recently we’ve been getting a lot more. 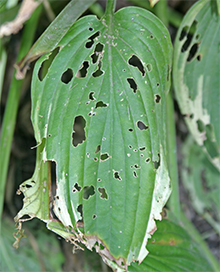 Most of the time, this damage is the result of snails and slugs snacking on the leaves of the plant during the night. Snails and slugs are slimy creatures that venture out under the cover of darkness and feed on the tender leaves and stems of many garden plants. Since they feed at night, they are usually not “caught in the act” like many of our other garden pests. They leave ragged holes in the foliage of our prized hosta and zinnias and can completely devour young seedlings in the vegetable garden in a matter of a few hours. These nasty pests secrete a slimy mucous which covers their soft bodies and as they move along over the plants, they leave silvery slime trails behind on the foliage as evidence of their feeding excursions. Hosta, Delphinium, petunias, zinnias, and leafy vegetables are some of their favorite foods. Slugs and snails are normally active when the weather is cool and/or damp which usually means a peak of feeding activity (hence damage to our plants) during the spring and fall. Unfortunately this coincides with the time when we gardeners are trying to establish our vegetable and flower gardens. During the heat of the summer, they become less active; seeking out cool hiding places to hang out in until the weather becomes more to their liking. One way to beat a slug and snail problem is to plant things that they don’t find palatable. Plants with thick, leathery or rough leaves, plants with hairy stems or foliage, and plants that exude a lot of sap when injured are generally avoided. Believe it or not, there are even some hosta that are passed over by these guys. 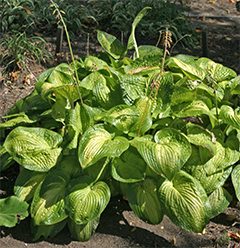 Hosta with heavy substance or thick waxy leaves like ‘Love Pat’, ‘Paradigm’, ‘Sum and Substance’, and the sieboldiana and tokudama cultivars are usually left alone. Hosta ‘Paradigm’ has thick, heavily textured leaves that slugs can’t “chew”. Unfortunately, many annuals and perennials that we plant are susceptible to snail and slug predation. For these plants, controls are often needed to prevent damage. 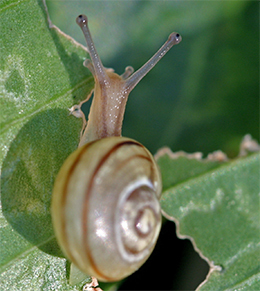 Hand picking is one method of control for snails and slugs. It’s not too bad to remove snails because you can pick them up by their hard shells. Slugs are another matter, though. I, for one, just don’t have the “stomach” to pick up their slimy, muscular bodies. When I accidentally squeeze one that is hiding under the lip of a pot or a flat of plants, I just cringe. And then there’s the slime that takes a vigorous scrubbing with a brush to get off your hands … Ewwww, nasty! Instead of going out at night with a flashlight, a better way to take care of picking slugs is to lay short boards on top of some low stones to create hiding places for them. In the middle of the day, turn over the board and use a stick or something to knock any slugs off into a bucket of soapy water. Take that you slimy beasts! 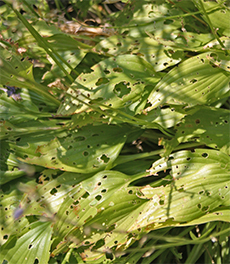 Another variety of hosta in close proximity to ‘Paradigm’ is heavily damaged by slugs. There are also some all natural slug and snail control products available for use on ornamentals as well as in vegetable gardens and around fruit trees. Most of these are composed of pelletized iron phosphate and are safe to use around pets, wildlife, worms, and beneficial insects when used according to the label directions. They are easy to apply – just sprinkle on the ground around the plants according to the label directions. Some examples are Bonide Slug Magic and Bayer Advanced Natria Snail & Slug Killer Bait. My hosta look terrible because of all the slug and snail damage. Should I do anything special to them now that fall is here? This is a great question. At any time, you can prune off any yellowed leaves or damaged leaves to make the plants look better. In the fall, if your hosta (or other perennials) have become yellow and ragged looking, you can simply cut them back to the ground. Fertilize them after you cut them back and again in the spring with Plant-tone or Holly-tone. They will come back beautifully in the spring. A Stinky Problem in Tomatoville! Oh the trouble we’ve had with stink bugs in the garden and orchard this year! We’ve received loads of calls and e-mails about these pesky bugs but especially in the last month or so. Why? Because it’s tomato season and it seems that these nasty creatures are as fond of America’s favorite garden crop as we are. All over the country, tomatoes are being ruined by stink bugs – and it’s not just the imported brown marmorated stink bug I’ve talked about before; there are native species as well that are sucking the life out of our tomatoes. The green stink bug (Acrosternum hilare), a native of the United States, just loves tomatoes and many other fruits and vegetables as well. I haven’t noticed this one in my gardens but I imagine it is around. I have noticed the brown marmorated stink bug on my apples and on various vegetables in my garden. The green stink bug came to my attention a few weeks ago when Sue, a listener from Cold Spring, NY, called Mark on his “Easy Gardening” radio show with a question about some “ugly bugs” on her tomato plants. She said these bugs were just devastating her tomatoes, making the fruit inedible. These “ugly bugs” turned out to be a green stink bug nymph – probably the last instar before the adult stage. Sue sent us some “graphic” photos a few days later which confirmed the identification. 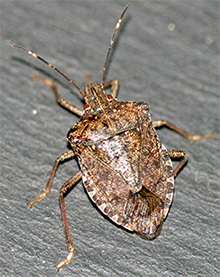 Stink bugs physically damage tomatoes (and many other fruits) by piercing the skin with their needle-like proboscis, injecting a digestive enzyme which liquefies the tomato pulp, and then sucking up this juice. The process leaves dimples and blotches on the tomato surface and creates a whitish corky area below the skin. If it’s not too extensive, the damaged portions can usually be cut out but some say that the taste of the tomato is altered in a negative way. 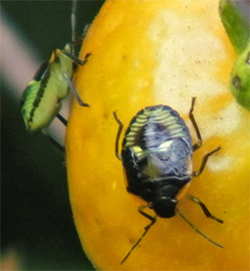 In addition to this physical damage, stink bugs can transmit disease pathogens to the fruit when they feed causing them to decay at a faster rate. Stink bugs don’t always cause as much damage to the fruit as they did on Sue’s tomatoes. She was plagued by huge numbers of them in her garden and the tomatoes were truly ruined. 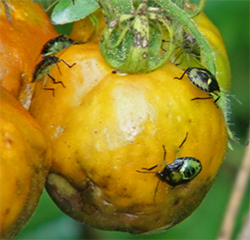 Typically, stink bugs will target only one or two tomato varieties in the garden, not all. This provides support for the recommendation that you should always grow more than one or two tomato varieties in your garden. One each of at least 6 different varieties is a good start. Insect and disease problems (even weather related problems) affect different varieties in different ways; some are more susceptible than others to certain pests, diseases, and weather conditions. The more variety you have in your garden the more likely you are to have something that will flourish no matter what the season brings! As I mentioned in my last post, keeping your garden free of weeds will go a long way towards keeping it pest free. These pests rely on a heavy cover of foliage to hide from predators, lay their eggs, and feed. By eliminating the weeds, you eliminate this refuge. Planting what are called “trap crops” can also help by diverting the stink bugs to those plants rather than your vegetable crops. Some suggestions include mustards, millet, and sunflowers (they seem to be attracted to the color yellow). 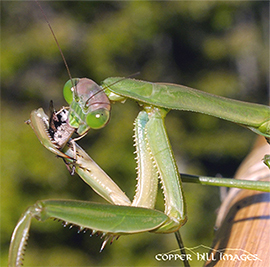 Encourage natural predators like the praying mantis to live in your garden by placing their egg cases which are often found attached to the stems of plants in the garden. Hand picking is always an eco-friendly option; just carry a bucket of soapy water around with you to drop them in. PureSpray Green is OMRI listed and can be sprayed on vegetable crops as well as ornamentals to help control stink bugs. Control is more successful on the young nymphs than on the adult stage. Always apply according to the label directions. I can definitely sympathize with Sue. It’s very disheartening when you put so much effort into your vegetable garden, keeping it weeded, watered, and fertilized; nurturing the your plants along so they will bear beautiful fruits and vegetables only to have all your work come to nothing when some devastating pest or disease takes the whole thing away. Not much left of this butternut squash – time to get the rest outta there! Between our woodchuck, the deer, and the downy mildew in our own garden this year, our harvest has really suffered. The woodchuck actually took up residence in the “three sisters garden” digging a deep burrow under one of the corn mounds! When he began to eat the winter squash, we knew it was time to harvest! After a record harvest last year, I didn’t even have enough cucumbers to make a single batch of pickles this year! I am so surprised that the deer would actually eat cucumber leaves, they’re so spiny, but until we managed to keep them out with a 7-foot fence of wildlife netting (on top of our existing fence), they would come in every night and browse on my cucumber leaves and also on our pole beans! Fascinating but very discouraging to a gardener! I hope Sue has better luck with her tomatoes next year and hopefully she has some friends that will share some fresh garden tomatoes with her this year. There is nothing better! Last week Mark Viette called me up to his house for a weed/insect photo shoot. He had been walking through his gardens and noticed a lot of insect pest activity on some of the weeds that were scattered throughout the beds around his house. This provided a strong argument for keeping the garden free of weeds because weeds often harbor lots of insect pests. Better get busy Mark! 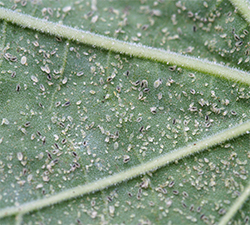 The worst infestation and the one that could potentially cause major problems in both the flower garden and vegetable garden was the whitefly on the velvetleaf that had grown up in the garden. When these plants were bumped, clouds of tiny white flies billowed up from the foliage. Yikes! Once you have whitefly in the garden or worse yet, on your indoor plants or in the greenhouse, they are extremely hard to control. The life cycle of whiteflies is usually completed in 30-40 days and unfortunately, all stages of this life cycle can coexist at any one point in time which makes control of this pest difficult at best. The problem is that most of these life stages are resistant to insecticides. 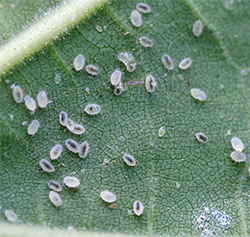 Whitefly eggs (loads of them) are laid on the underside of leaves. These eggs hatch out after about 5-7 days and go through four nymphal stages (instars). The first instar, the crawler stage, is mobile and crawls around on the leaf eventually settling down to feed on the leaf juices. This stage lasts only a few hours but is more vulnerable to insecticides. The later nymphal stages are sedentary and flattened out rather like scale insects. At these later stages, the nymphs are harder to control. The adult whitefly emerges from the fourth nymphal stage and the cycle begins again and again … with many overlapping generations throughout the season. tiny clear oval eggs and several different nymphal instars. 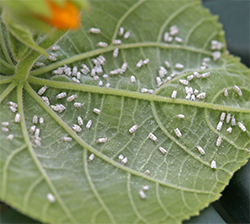 All stages of the whitefly feed by sucking the juices from the leaves of the plant. This causes the leaves to become wilted or even deformed. They eventually turn yellow and may even fall off. 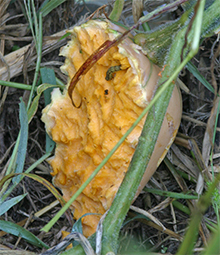 As they feed, the nymphs excrete honeydew which attracts ants and also encourages the growth of black sooty mold which makes the plant unattractive in the garden. 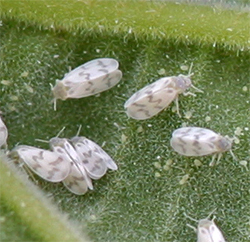 Severe infestations of whitefly can cause plant health to decline. The adult whiteflies are known to transmit viruses to other plants. In colder zones, whiteflies are troublesome in the garden only during the summer and early fall because they cannot survive the winter. They can however persist year around in the greenhouse and indoors on houseplants where they can cause major damage to plants if the populations buildup. Whitefly control is tricky since only certain stages are killed when the plants are treated; other stages are able to survive. Because of this, a strict spray schedule must be followed in order to obtain good control. Horticultural oils such as Bonide All Seasons Oil and PureSpray Green, as well as neem oil and insecticidal soap sprays can help control whitefly when used according to the label directions. When you spray, it is imperative to coat the lower surfaces of the leaves because this is where all the whitefly stages are found. Some systemic insecticides such as Bayer Advanced All-In-One Rose & Flower Care and Bonide Systemic Insect Spray have been shown to be effective in controlling whitefly when used according to the label directions. These products may not be available in all areas. Always read and follow the label directions. 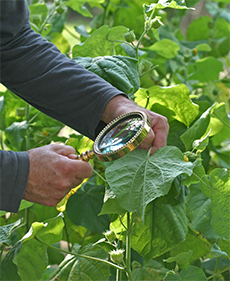 Mark examines the underside of leaves for insect pests. 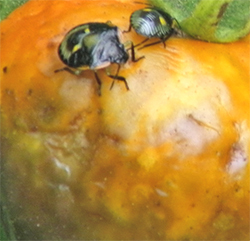 In the greenhouse, yellow sticky cards (whiteflies are particularly attracted to the color yellow) have been used to monitor populations of adults and in some cases can offer some amount of control. Indoor plants and outdoor flower containers can be treated with Bayer Advanced 2-in-1 Insect Control Plus Fertilizer Plant Spikes according to the label directions (this product may not be available in all states). If the infestation is not severe, often you can simply prune off the leaves that have heavy concentrations of eggs and nymphs (usually the lower leaves), seal them in a bag, and discard them in the trash. In fact, at this time of the year, most perennials can be cut back to the ground. Good fall garden maintenance will go a long way towards ensuring a healthy, weed-free, pest-free, disease-free garden next season. So on these upcoming beautiful fall days, get out in the garden and do some cleaning.